Clip: Titanium coated stainless steel clip. Very small but very powerful (800lm I do not know but 700 for sure). Already impressive. It is programmable after a long press of 8 seconds. In special modes you will find brightness programming levels. MANKER quality is always present. I recommend using 14500 unprotected to get the best performance of this small lamp that is a small bomb of power compared to its size. The beam is wide and very good to see from near to medium distance. Perfect for everyday use. No very concentrated hotspot but a comfortable beam. Excellent flashlight for EDC, lightweight, compact and powerful, the use of different types of batteries and AA batteries allows greater flexibility to acquire and use what is easier for the user, however, they will have a problem to use protected batteries, since the flashlight is too small to fit a protected 14500 battery. I solved the problem by removing one of the springs from the rear cover, the larger (external) spring, I removed it with pliers and was able to use 14500 protected batteries, but the cathode gets a bit dented due to the spring pressure on it, nothing that will spoil the battery, but the 14500 unprotected batteries and the AA batteries are shaking a little when making more sudden movements, nothing that will get in the way too. My biggest criticism here is with regard to color of light, the model with neutral white light (NW) is more to warm white (WW) because the light is very yellow compared to other lanterns that also have led with light and white neutral. So whoever is buying, better ask for the model with cold white light, other than that, difficulty in using 14500 protected batteries, the model in neutral light is actually warm light and the flashlight does not have protection against inversion of polarity, it is a great flashlight to walk with it in his pocket. Best flashlight with AA battery! The midget size is really great! The power of the lumens for this scale and power source, is a one big technological achievement! The body quality is excellent.Carry it in the pocket, the sense of weight is almost equal to zero. When I got this flashlight, the small size surprised me. I knew it was 82mm long, but it was a bit hard to turn that number into "real life" measurements. Let me tell you, thanks to straight design, with the head being the same size as the tube, and the deep carry clip (very strongly attached IMO), it is a very easy light to EDC. 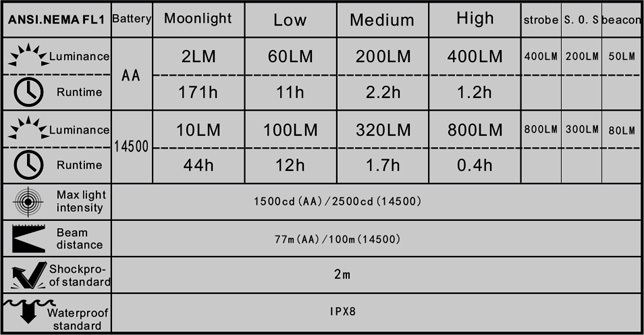 I would personally recommend using it with Ni-Mh, which will let you keep a moonlight mode, but if you want those sweet, sweet 800 lumens, go ahead and try it whit 14500. Be sure to buy high discharge rate batteries, though. Personally, I find the UI easy to understand and use. Keeping the strobes out of the "normal" mode group is fantastic, and the modes are well spaced. 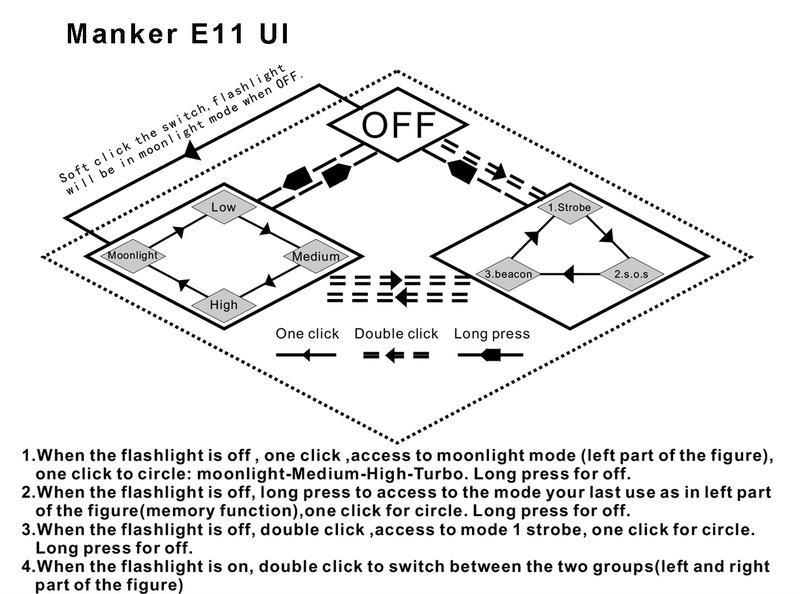 I would have liked another setting between moonlight and low, or alternatively, a 2-30-120-400 spacing, if keeping the 4 modes, instead of adding a 5th, was preferred. Still, mode spacing and UI depend mostly on the user. The build quality is great. The light will not roll away, even without the pocket clip, thanks to a square space around the button. It tailstands very securely. The orange peel reflector smooths the beam perfectly, and the reflector itself is threaded into the head of the light. The threads are anodized, which allows you to lockout the light to avoid involuntary activation, and the anodization itself is of great quality. As a finishing note, the ability to use standard AA in a pinch is great extra. And if you turn the body of the flashlight around, you can carry it head-up, but it wont be a deep carry. Still useful to attach the light to a cap, and use it as a makeshift headlamp. Click the button below to add the Manker E11 800 Lumen Mini Pocket EDC AA /14500 Flashlight to your wish list.